Why would you hire a snow clearing company vs. a snow thrower? 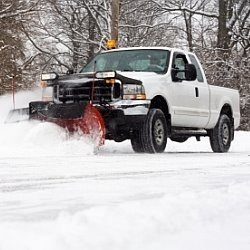 There are many reasons to hire a snow clearing company, but many people resist because they know that it is less expensive to just purchase a snow thrower. There are conditions which make one or the other more attractive from a financial perspective. In addition there are other practical reasons that make it reasonable to hire a snow clearing company. We will discuss some of these concerns and issues in this post. Bottom line, it is a very personal decision regarding which solution you pursue. The decision involves both how much money you have and also how comfortable you are in operating this kind of equipment. If you are not very handy and do not like large noisy machines that you have to maintain, hire a snow clearing company. These are the main areas that every person should consider before they purchase a snow thrower. Financial – A snow thrower properly maintained should last many years. Take the cost of the snow thrower divided by the annual cost of hiring a snow clearing company to find out how long it will take you to break even on the costs. If it is less than the expected life time of the snow thrower, then it is a good idea from a financial perspective to buy the snow thrower. in most cases unless you buying an expensive snow thrower, the payback will be less than 5 years. Most machines that are well maintained will last for ten, to 30 years. Transportation – If you cannot maintain it yourself, you will need to arrange transportation to take it to a repair shop. Factor in this issue to make sure that you can accommodate this need. Maintenance – The oil should be changed every year or more often in high use situations along with the spark plug. Check the belt tension and lubricate as needed. If you can do this yourself, you can save a great deal of money. Repairs – Most machines will never need repairs especially if they are maintained properly. Can you change tires, change belts, change spark plugs, etc yourself. Operation – some people are just not comfortable operating a large noisy snow thrower. Although you want to save money, it may be better to just hire someone. This is a very personal assessment that everyone needs to take into account. If you travel, are away on business trips, or just do not want to be bothered clearing snow at 6 in the morning so you can get to work, then hire a snow clearing company. It is pretty nice to look out your window and see a clear driveway that has been cleared sometime during the night! 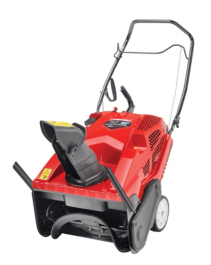 Our last post compared a high priced snow thrower at $2500 with one that was priced at $1400. This post compares our $1400 model with one that costs only $650 Canadian. Note that sales tax is extra for all of these prices. Our low priced model is shown in the picture on the left. It is a Troy-Blt 208 cc, single stage machine. This is the major difference between both of the machines we previously compared. A single stage machine does not have an impeller to drive the snow pulled in by the auger out the shoot. Instead the auger turns at a higher speed and blows the snow out the shoot. It is also only 21 inches wide compared to the 28 inch machine and has a 208 cc engine vs a 277 cc engine. The lack of power and single stage really means that these types of machines are only suitable for light snow conditions. Any time you run into heavy wet snow or snow with lots of ice in it, you may find that this small machine will just not do the job. We have compared a Troy-Blt 277 cc 28 inch dual stage snow thrower with a smaller 208 cc 21 inch single stage snow thrower machine and a monster Troy-Blt 4200 cc machine dual stage machine with two additional tires and capability to deal with just about any kind of snow condition. If you have light snow conditions, then the small 208 cc snow thrower will be fine as long as you are prepared to shovel, rely on a friendly neighbor or hire someone to clear the snow when heavy wet snow falls. Storage can be an issue. The Troy-Blt 208cc snow thrower can actually be hung on the wall with suitable support. All snow throwers in this case sold by Canadian Tire in Canada come with a 4 year warranty. Your choice of snow thrower aside from price really comes down to how much snow you have to deal with each year. Also whether you are prepared with a backup plan. These machines are just not set up to handle any amounts of ice. Often the city snow plow will clear the streets. As a result this means a large drift at the end of your driveway. This kind of snow is usually hard packed. It is even difficult even for some of the larger snow throwers to deal with. Let alone these smaller single stage machines. They simply cannot handle it and you are left to shovel the snow yourself or relay on a neighbor. Another situation is when there is lots of slushy snow that is pushed off the road by the city snow plow. You do not get to it quickly and it begins to freeze. In this situation these small snow throwers cannot chop up the ice and they cannot remove it from your driveway. If you encounter either of these conditions, don’t bother purchasing one of these small machines. They are suitable for sidewalks and as we said earlier light snow conditions. 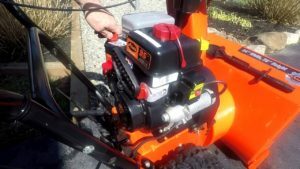 Snow throwers or snow blowers depending on what you call them come in different sizes and capabilities as well as the price varies a great deal. For example the one shown in this picture is a Troy Built 420 cc, 45 inch snow thrower and costs $2500 in Canada. A smaller machine, also Troy built costs $1400, almost half the price and comes with less capabilities. We were wondering what the major differences are and why would you spend another $1100 to purchase the more expensive machine? When would you need a larger machine to clear snow, where would you store it, are they difficult to handle? They both have 6 forward gears and two revers gears, but the larger machine has four tires while the smaller one has only two tires. Speaking of size, and size matters in this case, you have to compare several different characteristics to full appreciate the differences. The engine is 420 cc vs, 277 cc, the weight is 461 pounds vs. 235 pounds and the clearing width is 45 inches vs 28 inches on the smaller machine. If you are going to clear a 45 inch wide path at one time, then you need more power and more weight to clear this kind of snow which the Troy-Blt 420 cc machine delivers. 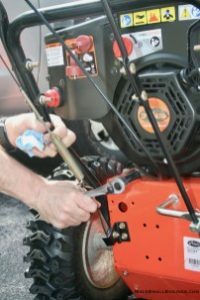 On the Troy-Blt 420 cc machine the clearing height is 22 inches, while on the smaller machine it is 21 inches. A remote tilt and chute direction crank complete the major differences. The real difference and what you are paying for really comes down to clearing width, power and ability to finish a larger area that much more quickly. Consumers with long driveways or large parking lots will appreciate the size and power when it comes to clearing snow. Another factor consumers need to consider is the width of the machine and where you are going to store it. Most people have a one or two car garage. You may or may not have the room to store a 45 inch wide machine. A 28 inch machine, although only 17 inches different can make a huge difference when storing these machines. If you are thinking of storing it outside, the machine will not last nearly as long unless you protect it from the weather somehow. Before purchasing a snow thrower, give some thought regarding about where you will keep it when not in use. Most consumers with short driveways and only one or two car widths will do just fine with the 28 inch machine. Having used both machine widths, I can definitely say that if you can afford it and have a place to store it the wider more powerful snow thrower is the way to go. Anytime you have a really long driveway, or a large parking area to clear, the larger machine will allow you to remove the snow much more quickly. 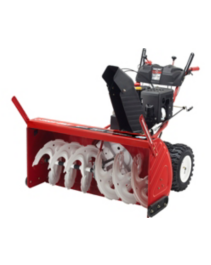 If time is important and it is to most people, then a larger snow thrower is something you may want to consider.